Development challenges are increasingly complex, inter-connected and the pace of change is unprecedented. As these changes affect all countries across the globe, it becomes more important for organizations to be able to respond to complex challenges with flexible, innovative solutions, and shift away from business as usual. Since 2012 UNDP has been investing in exploring innovation with the belief that innovation happens through practical explorations of new ways to address old problems. 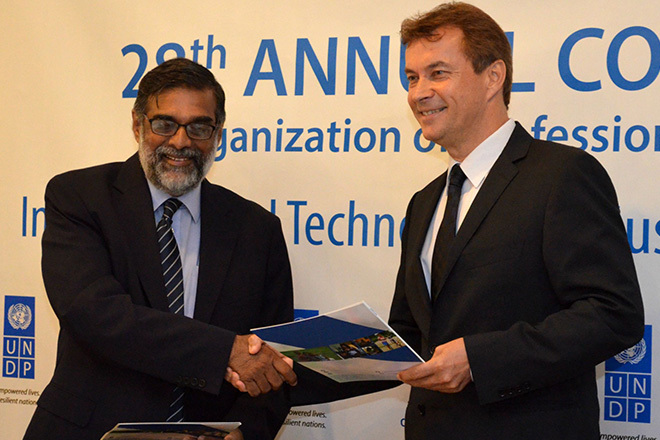 To drive this agenda, UNDP Sri Lanka is proud to have partnered with the OPA, as the theme is resonant with the goal of UNDP to integrate innovations in solving pertinent developmental issues in the country. Other speakers including Mr. K. A. Kiththi Perera and Mr. Ruwan Gallage echoed similar sentiments in their statements, adding that the conference would make innovative practices within the corporate sector and industries more than just a buzzword, with the aim of inculcating innovative thinking to boost business practices and economy.